Home Music October Music Review: Hit Or Miss? October Music Review: Hit Or Miss? Set to release on 13th April this year, October is the upcoming Bollywood romantic drama directed by Shoojit Sircar. The movie starring Varun Dhawan, Banita Sandhu and Geetanjali Rao in lead roles, is much anticipated. The mysterious and intriguing trailer has teased the audience into expecting a story that they have never seen before. Meanwhile, the music of the movie has been released, starting with the October Theme instrumental on 19th March, followed by three singles and finally the whole soundtrack album. The album consists of five tracks with two additional ones along with the singles that have been released previously. Rendered by Armaan Malik, this moving track was the first song of the album to be released on 21st March. The lyrics penned by Abhiruchi Chand is charming in the simplicity of its Hindi-Urdu fused wordings, while the music composed by Abhishek Arora gives a refreshing contemporary blues vibe without the over dramatic instrumentals that is typical of a Bollywood love song. The theme instrumental was released on 19th March as the lead single. Composed by Shantanu Moitra, the 3-minute-long instrumental is a soothing slow violin and piano rendition, with the emotions starting off steadily and then deviating every now and then into minor chords, evoking a new depth into the listener’s feelings. The instrumental might remind one of the sublime background instrumentals of Highway or Barfi! Performed by Rahat Fateh Ali Khan, the song was released on 28th March. The music is composed by Anupam Roy and gives a very mellow vibe initially, with only occasionally audible tabla beats. But as the song progresses the drums come in along with the flute and strings, and constructs a very dramatic yet compact track. The lyrics penned by Tanveer Ghazi reflect a beautiful Sufi vibe with mostly Urdu wordings and paired with the vocals of the maestro, the song is a classic Bollywood ballad. The track, rendered by none other than Sunidhi Chauhan, starts off slow and mellow, a somewhat common vibe of the entire album, with her profound vocals and minimal instrumentals. The Hindi lyrics by Swanand Kirkire is a poetic treasure at its best. The beats of the song are steady and grasping. Shantanu Moitra, the music composer has done a great job in creating a unique melody that is equally moving and soothing. Performed by Monali Thakur, this song is another achievement of Shantanu Moitra in the quest of versatility in his music. Monali’s voice perfectly complements the indie pop meets urban jazz vibe. The lyrics are yet again conjured by Tanveer Ghazi and does justice to the free-feeling casual happy melody of the song. It is no news that music is an integral part of any movie in Bollywood and determines to a large extent the anticipation and acceptance of a movie in the audience. 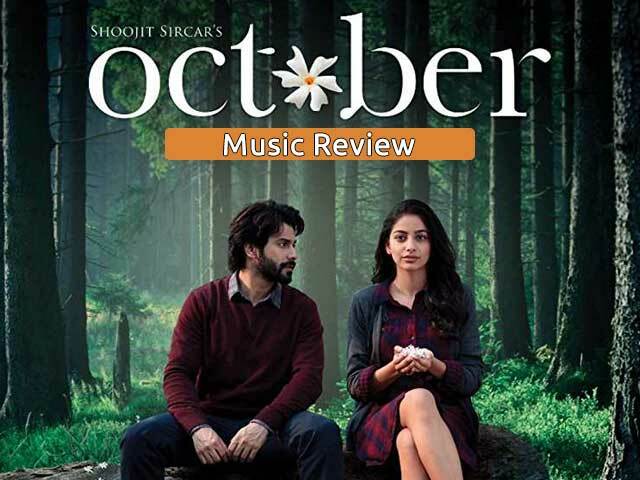 The album of October tends to make us feel that the movie is perhaps going to be the story of a reflective journey.